Finally, we have irrefutable proof that the Arab League is using adjustable weapons. The men who fire these missiles set them to either stun humans, disable weapon systems, or atomize the target. So far the cameras have captured only one missile switched to the “Atomize” setting. 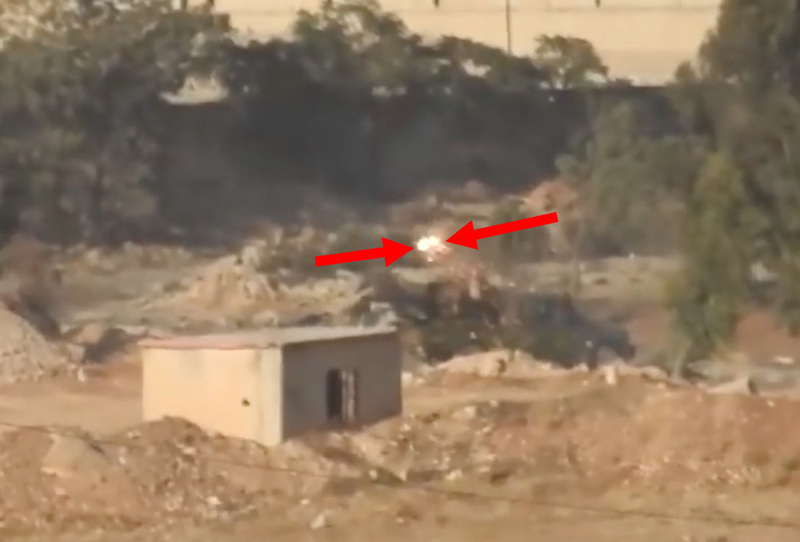 A Turkish M60 Patton tank was on the receiving end of that munition. 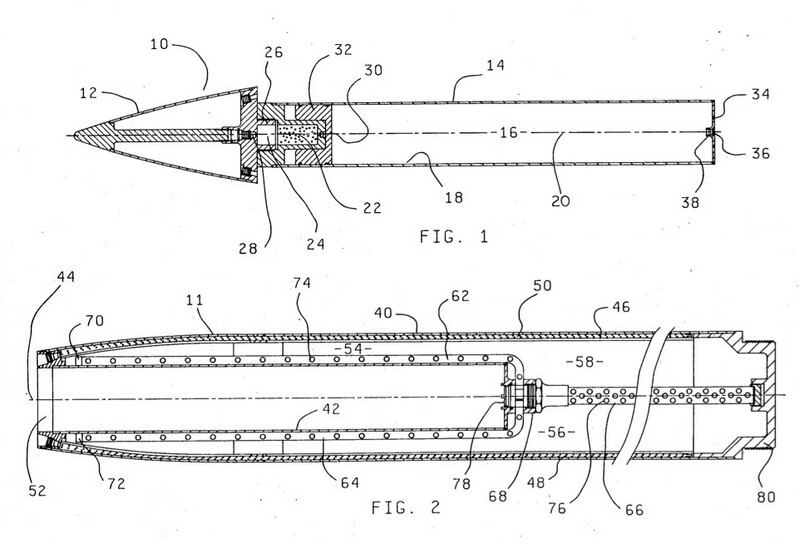 These new, adjustable missiles have binary fuel-air explosive (FAE) warheads. The explosive vapor and the catalyst are in two separate chambers. Therefore the missile gunner controls the intensity of the explosion. A time fuse detonates the explosive vapor at predetermined stages of blending. Below, the blue dye represents the catalyst, while the water is the explosive vapor. The more uniform the blending of catalyst and vapor, the more powerful the explosion. In the 1990s, Israel experimented with explosive gases that would send payloads into space using a giant cannon. The 1997 book Ram Accelerators: Proceedings of the Third International Workshop on Ram, edited by Kazuyoshi Takayama and Akihiro Sasoh (Berlin and Heidelberg: Springer Verlag, 1997), reported this on page 167. “Rom” is Professor Josef Rom, Department of Aerospace Engineering, Israel Institute of Technology, Haifa. These gases are also used in FAE. 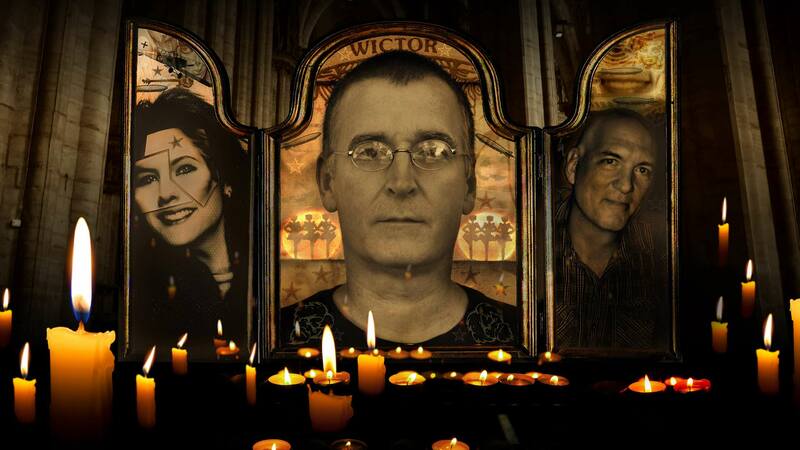 Israeli FAE are the most powerful ever invented. Another name for fuel-air explosives is “thermobaric” munitions. The average “weapons expert” knows nothing about them. Not if the missile gunner is able to choose how deadly to make his ordnance. As an illustration of non-lethal thermobaric weapons, we have the antitank guided missile (ATGM) below. 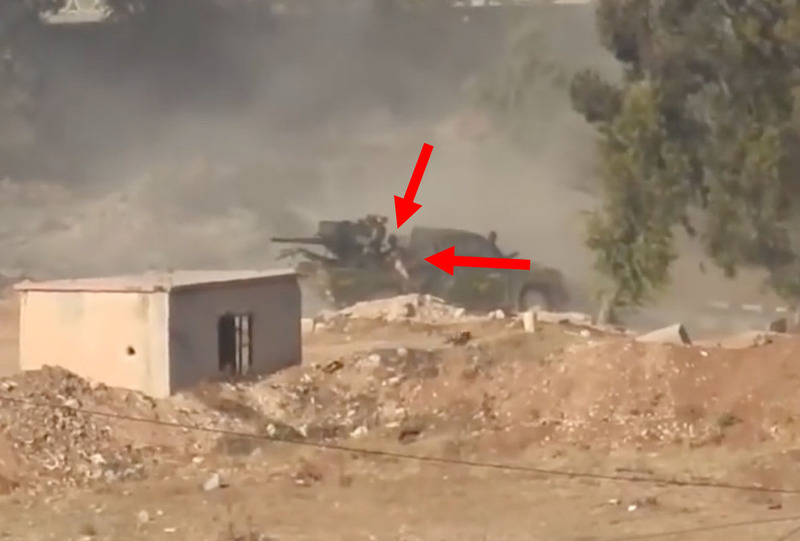 Although the Levant Conquest Front claims to have fired the ATGM, there’s no way that any Syrian rebels have such advanced technology. Each beacon emits a light of a different wavelength. As a result, the accuracy is doubled. 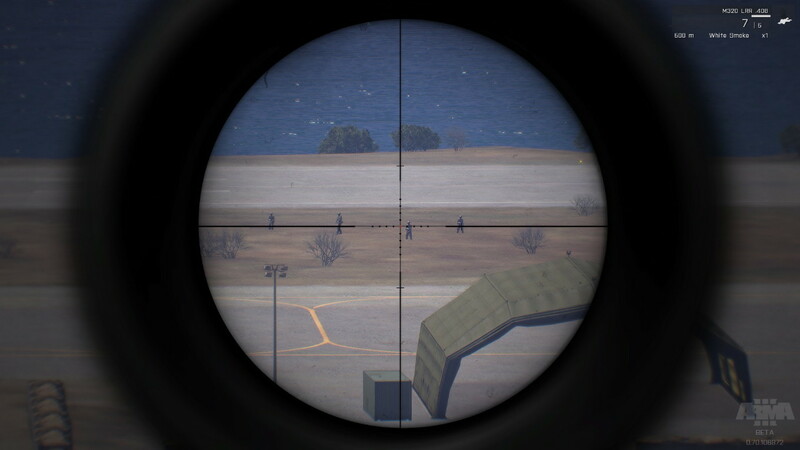 The guidance system is called “semi-automatic command to line of sight” or SACLOS. After the gunner launches the missile, he keeps a cross hair on the target. A sensor inside the launcher sight watches the flares on the tail of the missile and guides the munition to where the gunner has aimed the cross hair. Here is the signature of the new Israeli Arab League ATGMs with binary fuel-air explosive warheads. The missile directs the force of the explosion downward. A proximity fuse in the warhead automatically detonates the missile over the target. 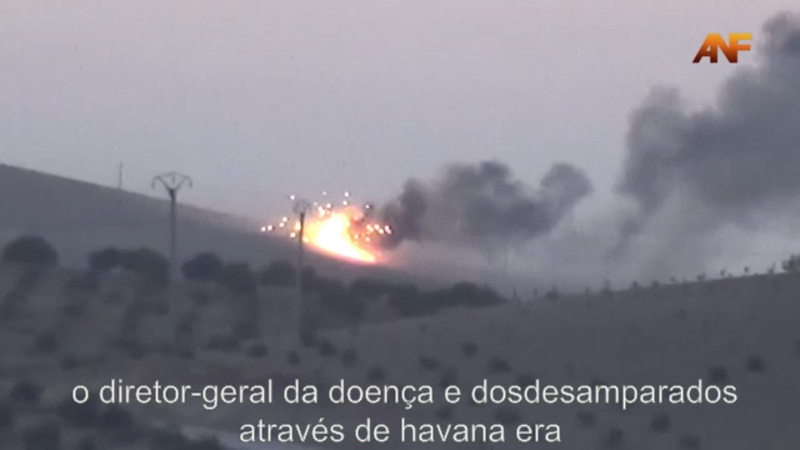 Although the force of the explosion goes downward, the fireball and smoke rise. Both men in the “technical” survived. They lifted their heads and moved their arms. A laser scored the add-on metal jacket so that it would break into diamond-shaped fragments. For the first time in human history, war is waged on military objects, not people. 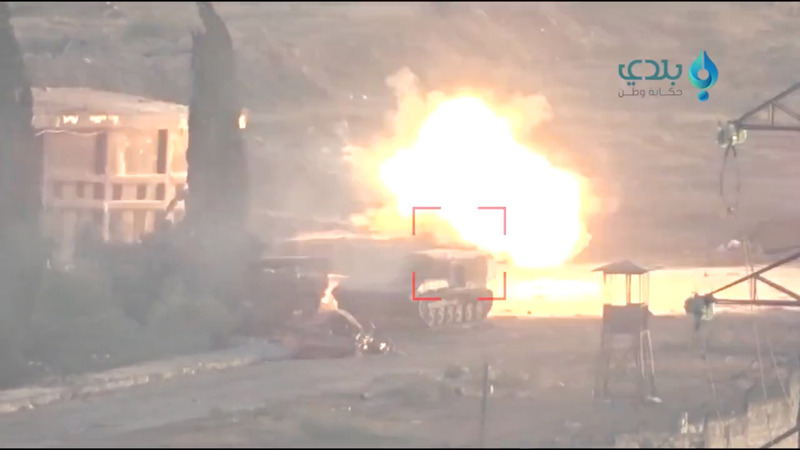 Next we have a new ATGM disabling an Assad regime T-72 main battle tank. 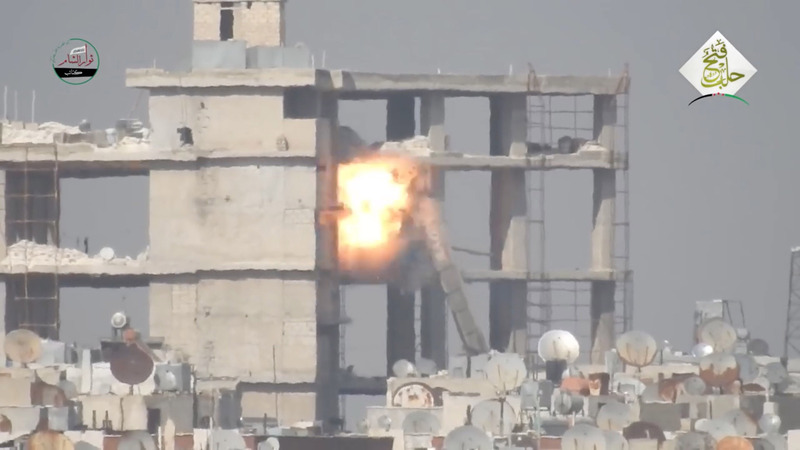 The Russian ATGM launcher seen in the video is for the 9M113 Konkurs or 9K111 Fagot. However, the man firing is an actor. 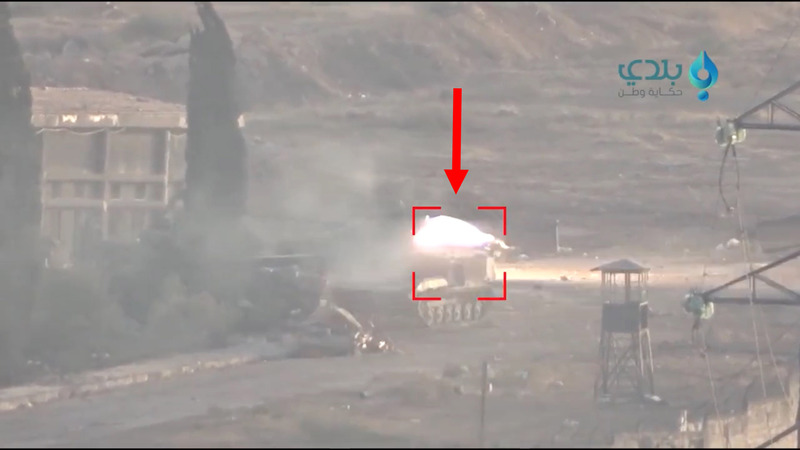 The munition is a new Israeli Arab League ATGM that no Syrian rebel possesses. As before, the missile directed the explosive force straight down. Then the fireball and smoke tower rose. 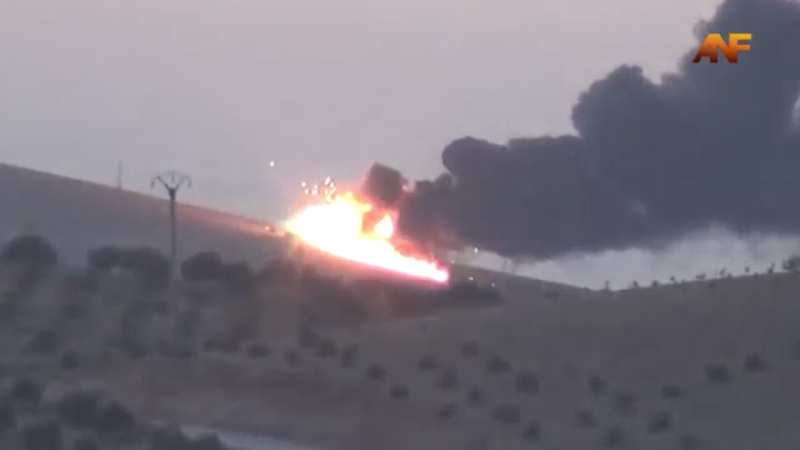 The missile exploded over the tank’s engine compartment. As a result, the tank will never run again. It’s likely that cavitation is the reason that these weapons are so powerful. The shock wave actually displaces atmospheric air, creating an empty bubble over the target. When the bubble collapses, and atmospheric air rushes in to fill the void, a huge amount of energy is released. That’s the only way I can explain the video below. 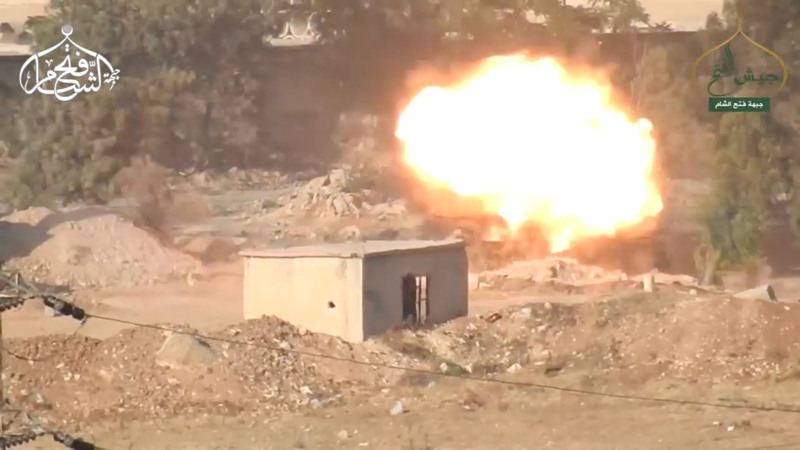 Arab League strategic special operators blast a Turkish M60 Patton tank into powder. When the missile strikes, there’s no explosion of a warhead that penetrates the armor. Instead, the entire tank blows up as is if it’s made of dynamite. Therefore you’re seeing completely new military technology. 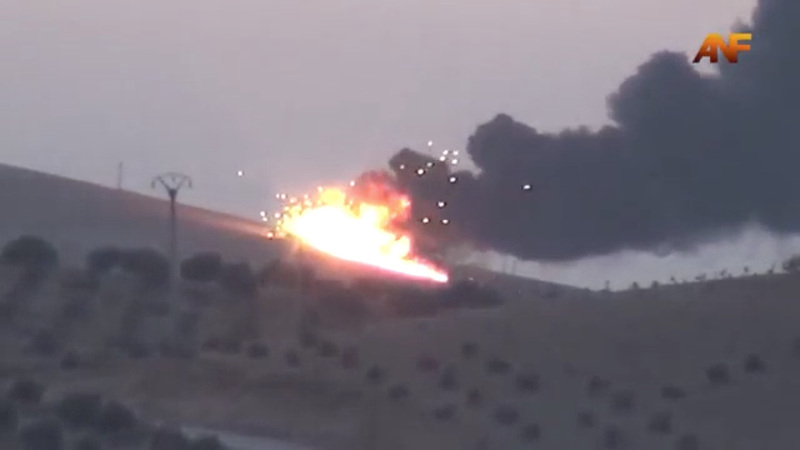 The missile used neither kinetic energy nor high explosives. It has to be cavitation. 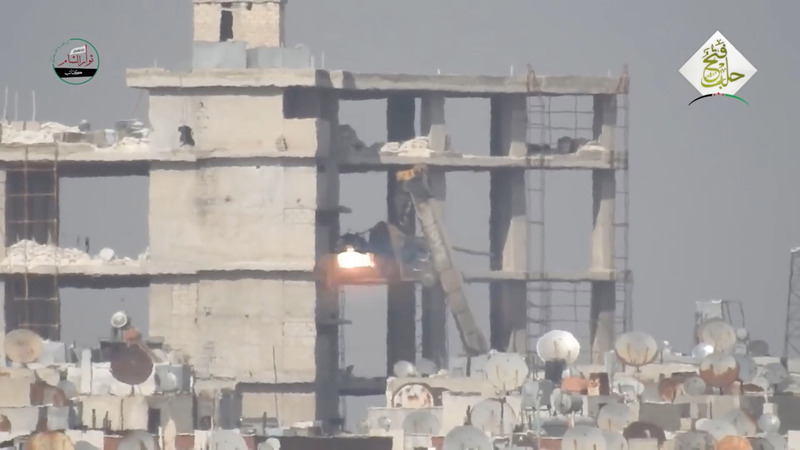 The fuel-air explosive created a void in the atmospheric air around the tank. When this “bubble” collapsed, it was like a small nuclear explosion. 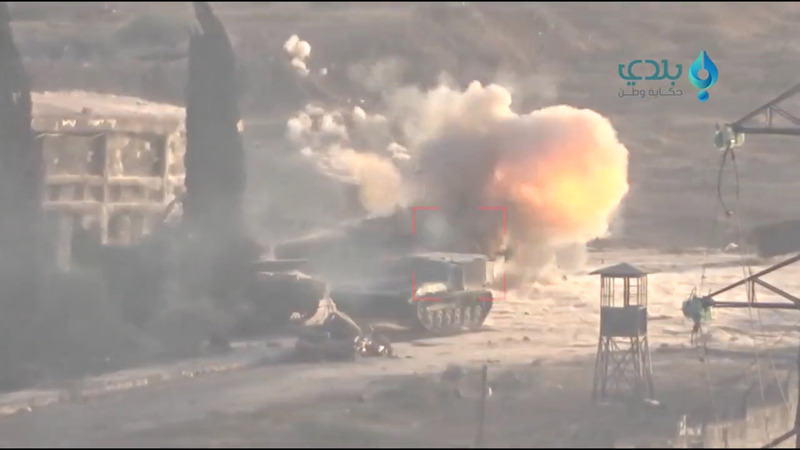 The tank simply disintegrated. I’ve never seen that before. 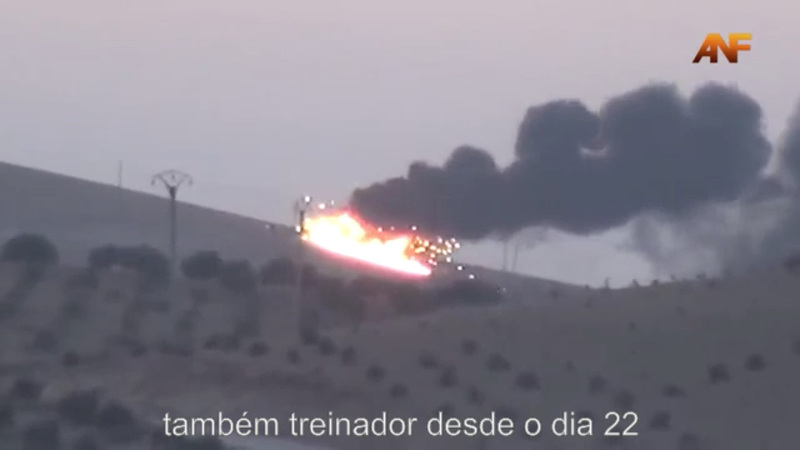 Here is what usually happens when a tank explodes. The turret and other big chunks fly off. In the case of the Turkish M60, we didn’t see that. It was as though the M60 vanished. 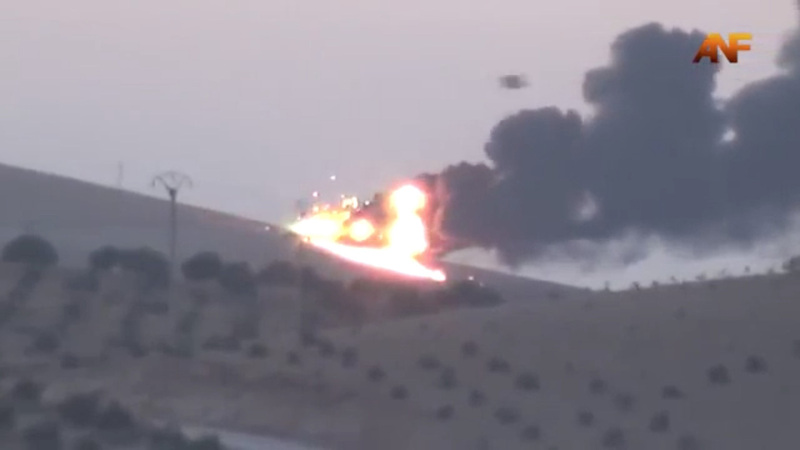 Also, there were six secondary explosions. It’s very unusual for the ammunition to take so long to “cook off.” Generally speaking, tank ammunition burns quickly instead of exploding. The tanks below are remote-control. They have no crews. 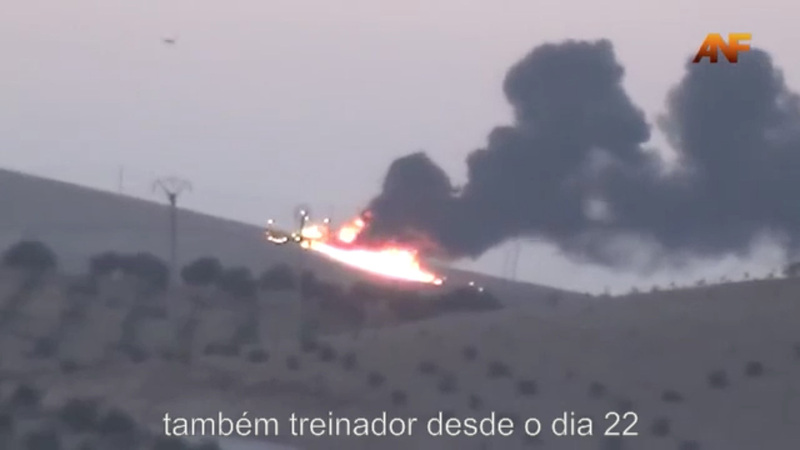 In addition, the diesel fuel of the Turkish M60 spilled out on the ground and burned for a very long time. This indicates that the missile warhead released relatively little heat. If in fact the new missiles use cavitation, they’d be making Earth’s atmosphere to do their work for them. Shockwave and Cavitation Bubble Dynamics of Atmospheric Air seems to show that the concept is viable. Air is a fluid. Apparently not one scientist outside of Israel and certain Arab League nations has ever considered whether or not the shock wave from a missile warhead could create atmospheric cavitation. 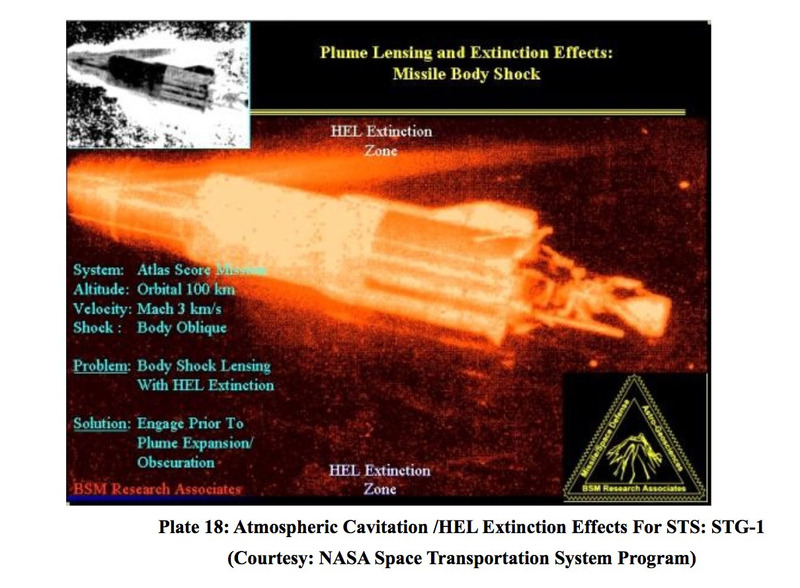 NASA also mentions atmospheric cavitation. If an Iranian rocket can cause it, so can an Israeli-designed antitank guided missile. 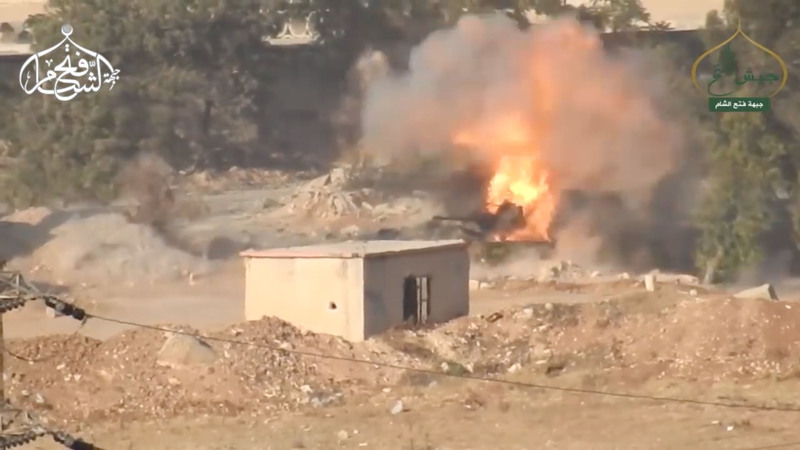 The warheads detonate with incredible violence. 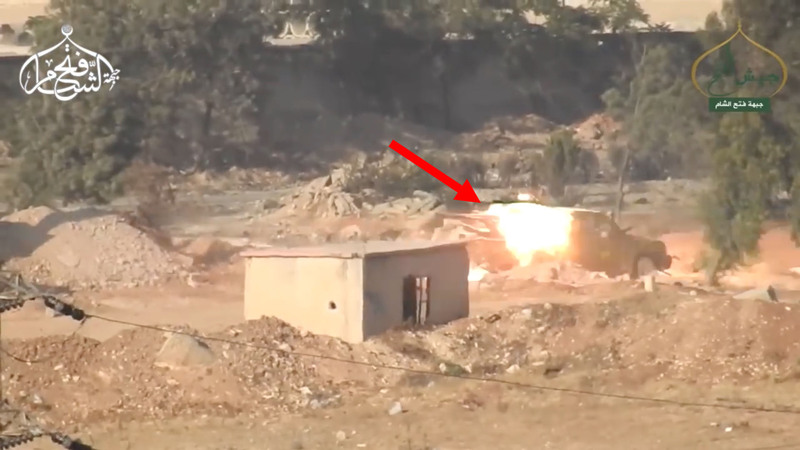 Don’t worry: Syrian rebels didn’t fire the ATGM below. And again, the explosive vapor is projected downward. I learned the very hard and discouraging way to never ask “experts” for their opinions. For this reason I don’t contact others to ask what they think about my ideas. And I learned that even though 46,000 people read my blog every day, only a few dozen think that I deserve some financial help in running this Website. So to the handful who donated, thank you. I’ll figure out a way to keep blogging. As I said, this is just a rough spot. In two years it won’t be a burden. To everyone else, it’s good to know where we stand. I always prefer the truth. This article viewed 49720 times.